WAINEKE WORK DAYS Beginning around 9 a.m. on October 20, volunteers from the Kaua`i Association, UCC, will be cleaning the grounds and cabins and do some minor repairs. These are “our” cabins, belonging to the KAUCC. We, as members and friends, have access to rent and utilize these two cabins throughout the year. Our youth, members, leaders, friends have taken advantage of this beautiful site. A couple times each year we ask for volunteers to help clean the inside and outside of Waineke. If you go up on Friday, October 19, you may stay overnight and food will be provided. If you can, bring a bucket, rags, sponges, gloves and any cleaning products you may have. Vote on a new Vision Statement for the church. Please click HERE to see the draft of the Vision Statement. You are asked to make suggestions to Kahu or any Council member by this Sunday. Please plan to attend so that we can have a quorum on that day. THE LATEST COCONUT WIRELESS The Hawai`i Conference of the United Church of Christ shares news on the Coconut Wireless, the regular newsletter of the HCUCC. If you would like to keep abreast on news, opportunities and events, please click HERE for the latest news. If you like what you see, you may subscribe and get every issue of the Coconut Wireless automatically and get the very latest news hot off the press. LECTIONARY READINGS (Old & New Testament Readings for the Week) Each week, Christians throughout the world read biblical passages from the Revised Common Lectionary, including the Old Testament, Psalms, New Testament, and Gospels. After three years, a good portion of the Bible is included and the cycle begins again. RCL passages are often read in church worship services, and Kahu Akana usually includes at least one of them on the following Sunday. This week’s readings are Job 38:1-41; Psalm 104:1-35; Hebrew 5:1-10; Mark 10:35-45. 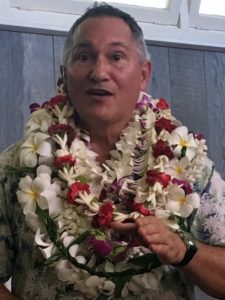 CHURCH BREAKFAST Tuesday, October 23, 7:30 a.m. Kalapaki Joe’s Poipu. Everyone is invited, bring a friend. Please contact Michael Horning (408-234-2447) if you plan to attend. SALVATION ARMY LUNCH We will be serving lunch at the Hanapepe Salvation Army on Wednesday, October 31. We need 4-5 volunteers. You can meet at the church at 9:30 a.m. if anyone wants to carpool or meet at the Salvation Army around 10 a.m. Please contact Suzanne Pearson if you want to participate: 742-2858. `AHA MOKUPUNI Churches in the Kaua`i Association will gather for the Fall `Aha Mokupuni on Sunday, November 4, from 3 p.m. to 7 p.m. at Hanapepe Hawaiian Congregational Church (3815 Hanapepe Road, Hanapepe). More information will be provided at a later date.